So to prove my point, I’m putting up together a list of 8 free ways to promote your business. These marketing ideas would not cost you money but require one time investment of your time. What is the first thing that people do when they are planning to buy something? Well, they search for that product or service on Google. First they try to collect as much information as they can about the product and then they search for vendors who sell that product. So, if your website is not appearing in Google search, that means you virtually do not exist. Buyers search for vendors in popular business directories. If you sell B2B products, add a free listing on IndiaMart, Trade India and Indian Yellow Pages. These are popular business to business directories. If you sell Software then SoftwareSuggest is a very good directory. It lists softwares in various categories like HR, CRM, ERP, etc. I have listed our accounting software there and we get good response from that listing. Google is making search personal and now displays results that are tailored for your location. For example, if you search for a McDonalds, it will show you the one in your city with a map. So, it has almost become mandatory for a business to get listed on Google Local. Google has made it easy to add & manage your location on map. You can also manage your Google Plus profile from the same place. Just head over to Google My Business and claim your listing. If you don’t have a physical shop, you can even add your office location and give details about your business. To start with, you should create profiles on Facebook, Twitter and Linkedin. This will not only help you get more customers but you can engage them and get quality feedback from them about your products or services. ProfitBooks’ Twitter & FaceBook page alone amounts for 20% of our total traffic. Here is a good guide to get started with social media. Also check this tutorial. Frequency of your posts is the key here. If you post regularly, you will gain popularity and loyal subscribers who can convert to your customers at a later stage. You can share your business updates or news related to your industry. Best way is to follow the influencers in your industry and monitor their activity. Ideally you should post twice a week on Facebook and 3-4 times a day on Twitter. When people are stuck and looking to solve their pain point, they turn up to specific forums on Internet. QnA sites like Quora and Yahoo Answers are popular places where you can find new customers. People also post their questions on Linkedin Groups. So how can you benefit from it? Create accounts on these sites and start searching for your product or service. For example, I will search for ‘Accounting Software’ as I want to create awareness about ProfitBooks. You will get lot of questions related to your product. People might be asking about the top companies that sell this product or comparisons between different products and so on. Start answering with the easy question and then move towards complicated questions. Again taking example of ProfitBooks, I searched for ‘Best Accounting Software‘ on Quora and got hundreds of questions around this topic. Then, I simply started answering and recommending ProfitBooks to users. We get a good amount of traffic every month via Quora. You can do the same on Yahoo Answers and Linkedin Groups. All these 3 networks are very influential. Best part is, these sites are indexed by Google. So, your answers will appear in Google search whenever anyone searches for it. Isn’t it great? Events/Expos/Meetups are the great places to expand your network and find new customers. Just search for “business events in (your city)” and Google with come up with list of upcoming events. Check AllEvents.in for events in various categories. Most of these events are free and attract customers as well as distributors/resellers/consultants. Another site which I absolutely love is Meetup.com. In my city – Pune, lot of entrepreneurs, startup owners meet frequently using this site. I make it a point to attend as many meetups as I can during weekends. People coming to these meetups are open minded and are open to new ideas or partnerships. Did you know that over 4 billion videos are played on YouTube daily? This number is growing every passing day. So, it makes a whole lot of sense to upload a video about your product or service right away! Best part is, this video will appear in search results as well giving your product more visibility. How to get started? First decide what you are going to create. For products, a short 2 minute demo will work great and in case of service, you can record a testimonial by a client and upload it. YouTube offers nice tools to edit the uploaded video. For example, you can add narration or music, trim video and do much more. Deal sites like Groupon and Coupon Dunia attract millions of users to their portals. So, if you can come up with a mouth watering deal, you can get good number of buyers at no cost. This is how it works – You will contact Groupon and their executives will meet you at your office. Then, you have to agree on a good discount (more than 30%) and commission percentage that will go to Groupon. Once this is done, Groupon will do the promotion for you. They have a huge database of registered users. Process will be more or less similar in case of other deal sites. 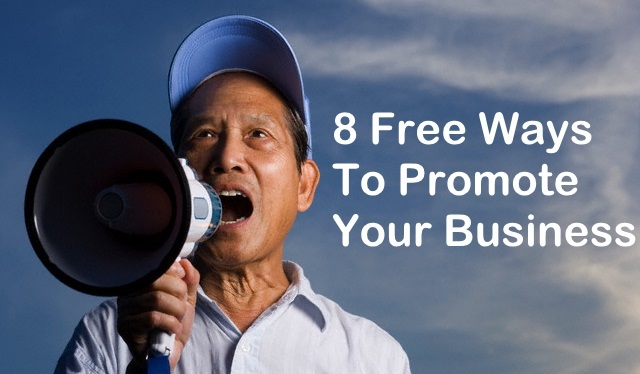 There can be more than just 8 free ways of promoting your business. All you have to do is to think out of the box and be creative. Some of the tactics mentioned above will yield results instantly and some of them might take it weeks of months before you start seeing results. If you don’t have big bucks to spend on marketing, you have to invest your time to promote your business. I’ve seen lot of businesses that succeeded with ZERO marketing budget. PreviousPrevious post:How to create Proforma InvoiceNextNext post:ProfitBooks Wins Hot 100 Startups 2014 Award! Indeed the suggested websites are best source to get your Business online and generate Brand awareness as well as generate Business Leads. I would thank the Author for sharing great Article. Very useful information for online shopping. Thanks for sharing this. Thanks a lot……. I will use this tips in my business…. Leaflet distribution/flyer distribution is also another way to promote business and excellent way to introduce and aware the local customers. Thanks @disqus_FGPSYvJLjx:disqus . Hope you have subscribed to our blog. Thats true. Digital marketing really pays back. Glad to know that you liked it Ravi. Glad to know that you like this blog. Don’t forget to subscribe to our newsletter. I read this blog and get some information about Web or Business Promotion Steps. Thank you profitbooks. I have just started my own website as an internet marketing consultant by the name of promotemybusiness.in and i need advice on offline marketing. I mean how to gather marketing persons for offline marketing and how to get leads. Join karnataka small and business owners association(KSMBOA) and avail all the services for free. Thanks for sharing this useful information!!! I didn’t know that MyDala has grown this big. Will mention in next iteration of the article. Thanks for sharing the information. Thanks for replying. I don’t want to involve is any discussion of which one is better. The reason because I mentioned mydala is because they are targeting more than 152 cities of India. And also their are more categories than Coupondunia, I don’t what are their future plans. mydala is providing deals in Online shopping deals, coupons for Restaurant, Spa, Travel and even for Grocery sections. That is why I was surprised when I see mydala.com name missing. By the way it completely your thinking. Even other free ideas you’ve putted in your post are grate. Thanks for your comment. Yes, MyDala is also good but Groupon and CouponDuniya (Earlier TimesDeal) have wider customer reach and hence I have included them in the list. Sure, businesses can also use MyDala to promote their products.